Janet Dawson was a pioneer of non-objective painting in Australia in the 1960s, and one of the period's most significant printmakers - both of her own work and as a master printer for others, through the Gallery A print workshop in Melbourne and then Sydney. Dawson's prints of the early 1960s explored similar formal concerns of colour, composition and use of materials to her paintings of that time. Dawson's imagery at this time was concerned with exploring formal values, in a variety of mediums. 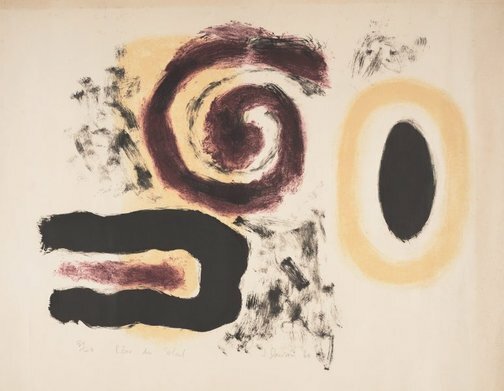 'Rêve de soleil (Sun dream)' was printed by the artist at Atelier Patris, Paris, at the same time as another print, already in the collection ('Vers l'ombre'), while she was working there as a proof printer in 1960. Dawson's Paris lithographs were included in important national and international exhibitions of Australian prints soon after they were made, and remain among the most exceptional prints produced by an Australian artist of the period. Signed and dated l.c., pencil "J. Dawson '60". Unknown, Janet Dawson , Melbourne, 1961, n.pag.. cat.no. 15; priced 15 gns; not AGNSW impression.